Because it's designed for the way you work, ConstructionSuite goes beyond synchronizing information between system components to offer dynamic integration with programs outside of the ConstructionSuite system. With the optional export to Microsoft Project, you can share project schedules with other people involved in your projects. With multiple options, Microsoft Project Export makes it easy to transfer the information you need for managing your schedules. Export information to Microsoft Project to share construction schedules with people who do not have ConstructionSuite installed. Select to export from either UDA Construction Estimating software or UDA Construction Scheduling. Export either task list only or the full schedule, including task names, start dates, end dates, durations, predecessors, and resources. Not everyone involved in your project has the convenience of the powerful ConstructionSuite scheduling system, but you can share project schedules by utilizing the MS Project Export with ConstructionSuite Pro, Premier, Corporate, or Network edition. 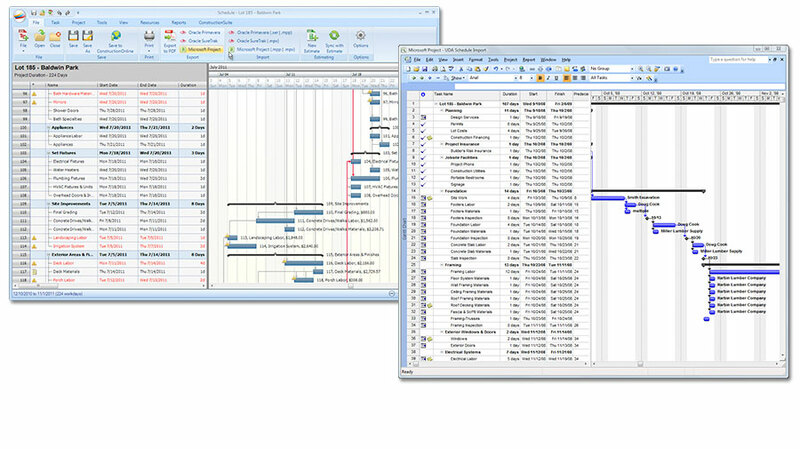 Saving construction schedules in read-only format, so clients, subcontractors, and others involved in your projects can view the schedule using only Microsoft Excel. Saving construction schedules in pocket PC format, which optimizes the file for use on a small-screen device. Saving construction schedules in HTML format for posting on your company web site.